I stayed at the los hibiscos.I found it a lovely friendly place. I was there for 21days.The apt was spotless and cleaners were lovely,one lady hummed while she cleaned she was lovely.It is ideally situated close to all amenities.Plenty of sunbeds round the pool,although in the summer you may struggle for a sunbed as there is not a lot of room around the pool.The apt are getting a face lift in the summer,as they are a bit dated.But all in all a brill holiday. We are just back from a Christmas trip staying in Los Hibiscos. We were disappointed with the overall tired look of the complex and unhappy to find dead or dying cockroaches every morning on the balcony of our first floor apartment. The entrance to the block we were staying in stank of cat urine. Cleaning staff came to the room about five days out of seven and towels were changed three times during the week. The towels were old and had a musty smell to them. It was a relatively expensive week there - 699 euro - and was definitely not worth that kind of money. It is a basic apartment complex lacking a welcoming atmosphere and with questionable standards of hygiene. I will not be returning. Myself and my best friend stayed in Los Hibiscos for a week in January and had a great experience. I was very nervous going to stay here as the majority of previous reviews were very poor but the Accommadation was very big and clean with great views. The bedding was changed twice during the week and the apartment was cleaned every day. The staff were very helpful and pleasant. 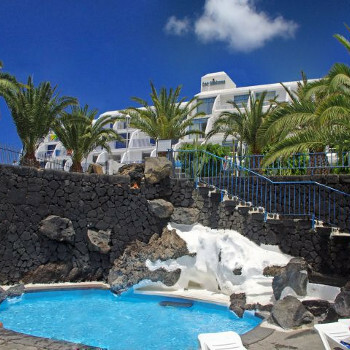 Other reviews stated the pool was very cold and it was... but all these reviews were written in Lanzarote winter months!!!! Its supposed to be cold and if these people read the apartment description it never states the pool is heated.... The Location of these apartments is Ideal. 3 Minute walk to the beach and Strip. I have been to Lanzarote before and these apartments are a little more basic than the usual on the Island but we ate out for the whole week so had no need for a kettle or toaster!! Also you have to rent the TV remote but its a deposit of 10euro!! which you get back! We rented a Dvd player and Ten films for the week for 30euro which came in Handy when recovering from a Hangover! We found two tiny cockroaches in the bathroom during the week but when your staying on any Spanish Island your never gonna avoid them totally. If i had anything negative to say about Los Hibiscos it would be no 24hr Reception and a very open complex ie: anyone could walk in and out. We were told a security Guard patrolled the complex but we never see him once during our stay. We noticed it more as we were two girls our own. There are a couple of cats in the complex but they are really friendly and keep there distance. Booked last minute deal with Sun World third time in pdc so knew location which is good and not even 5 minutes form the beach and resturants. Apartment was large and clean on arrival. Did not like the way the bedroom faced out to the corridor to the other appartments so you could not open the window as people could walk right by we had no view either but I suspose someone has to get these rooms. The tv remote had to be rented and the had the buttons on the tv broke so you had no choice to rent the remote most of the channels were in German only CNN and Eurosport which was mostly in German. Huge bug problem must have killed 10-15 first 3 night then the appeared to spray the rooms as there was no more. The neither changed the linen or towels in the week we were there. Pool was ok was dirty but useable. Typical Germans taking the sunbeds with shade but there was enough sunbeads to go around. Over all it was ok for what we paid doubt I would go back again. my boyfriend and i stayed here the end of september 2007. Having read the reviews before travelling I was not to enthuastiac but upon arrival i soon changed my mind. The apartments were very big but basic. They were cleaned everyday and the sheets were changed twice within the week. The staff did not speak much english but this this not prove a problem for us. I loved the pool and did not find it cold hovever the pool bar only opened for a few hours a day and was a bit disopointing. There was no restauraunt or bar but there is a nice little Irish place next door. There are two supermarkets situated across the road. The apartments themselves are an ideal location three mins from the beach and the nite life and half way between old and new town. I would defently stay here again if i was looking for a cheap week away. We stayed at Los Hibiscos last October and found it to be most pleasant. The complex itself is on a few different levels but ou apartment was close to the entrance so no problems there. Apartments were very big and well equipped. The complex is lovely and peaceful, perfect for lazy days in the sun. Evening time has no entertainment on site but is very relaxing all evening. The complex is well patrolled at night with security locking the main gate from about 12am so he is always there to open them. I would definately recommend these apartments for a good rest. They are located in the new town about 5 mins walk down a little hill to the beach front. There is a supermarket and bar/restaurant on site. There is a Spar shop directly across the road also. I would have no hesitation recomending these apartments for a relaxing holiday with typical spanish apartment style accommodation.